You are currently browsing the Pontiac Paradise Shop Talk weblog archives for August, 2009. Let’s Talk about SUPER DUTY Hood Scoops to Ashtrays! The word SUPER DUTY is tossed around this industry like a beachball. I’m sure if you’ve been on eBay in the last 6 years, you’ve seen countless auctions for SUPER DUTY everything. Tachometers, wheels, chrome trim, hood scoops (which I will talk about later) ashtrays, clutch pedals, radio delete plates and maybe even some REAL SUPER DUTY PARTS. First off, SUPER DUTY cars were only made between 1960 and 1963. They are beyond rare and fetch huge amounts of cash. Their parts are the same way. A lot of these cars were factory race cars and had their share of experimental parts like headers and intake manifolds. Very few were sold to the rich kid for a street racer. There were factory race cars in NASCAR and on the drag strips before SUPER DUTY and somewhat after the GM Ban on Racing in 1963. For example: Pontiac offered high horse engines starting in 64 known as HO Engines. They were 421’s or in later years, 428’s. However, people get confused as of course, everybody wants to find a SUPER DUTY GARDEN HOSE in their garage. The same thing is going on in the 1970 Chevelle market. Chevrolet made 453 LS-6 Chevelles in 1970 and only 20,000 still exist today, thanks to GM selling LS-6 crate motors. I see more 1961 Impala SS cars and 1969 Z-28’s then I ever saw when they were NEW! This is due to the reproduction of emblems. If it resembles a duck, it MUST be a duck theory. You know, if I see another SUPER DUTY Hood Scoop on eBay, I think I’ll go crazy! 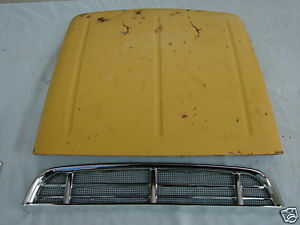 PEOPLE, THESE SUPER DUTY HOOD SCOOPS ARE OFF MID 70’S TO MID 80’S F-600 FORD DUMP TRUCKS! Some guy has one on eBay right now for $350! If Pontiac made all these hood scoops, where are the cars they came off of? He says it’s NOS. Really? Where is the box or GM part #? I just went out on eBay and saw 45 items listed under PONTIAC SUPER DUTY and out of those 45 items, 6 were honest to GOD Super Duty items for sale. I had recently emailed a person that stated he had a set of 63-64 SUPER DUTY clutch pedals. They were the standard heavy duty pedals with the large green spring. I have a partial set of 63 SUPER DUTY clutch pedals and they are NOTHING like the production pedals at all. Go look at 3-2 setups, about a third are listed as SUPER DUTY. People, all 3-2 setups that were SUPER DUTY were ALUMINUM, not cast iron intakes. Go to my Special Intakes Parts ID Section to see a boat load of SUPER DUTY intake manifolds. In closing, understand that people use the word SUPER DUTY to try and reach more people to sell their item to, however it’s a two sided knife. Not many state that the item they are selling is really not a SUPER DUTY piece. That is left up to you, the buyer to determine. You can get screwed out there really quick. When in doubt, ask if you can return the item if it is found not to be a SUPER DUTY part. Then see how they act! A lot of these people are the same people that will sell you a 1962 tach for your console in your 64 Grand Prix. They just want your money. Buyers beware!